I have a 40-minute commute to work. Yesterday, I was sweating bullets on my drive in. Not because of traffic or the icy roads, but because there was a little piece of ice on my windshield that I wanted to photograph, but didn’t dare while traveling 60 mph on the freeway – and I was running a little late and didn’t have time to pull over. The piece of ice was about the size of a quarter, but it was in the shape of a falcon. I kept imagining what the finished photo would like like, and what camera settings would be required to achieve those results. But why was this causing me to sweat bullets? Because as we all know, ice melts. I was determined to not use the windshield wipers for fear of killing my photo idea. But if you’ve scrolled down to see the photo, you’ll notice there is no ice falcon there. While driving near a semi, the mist churned up by its tires covered my windshield, forcing me to use the wipers and destroying my masterpiece (dramatic, I know). 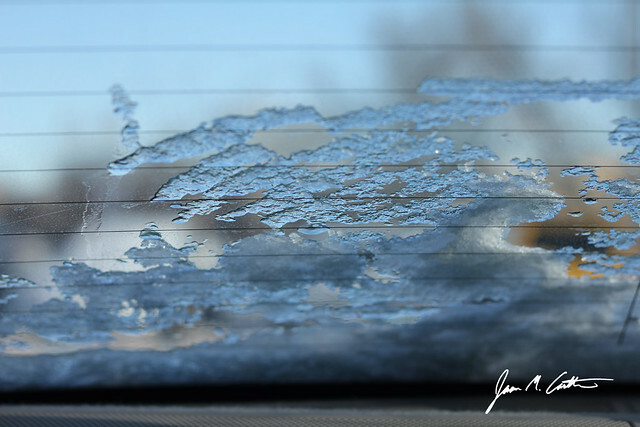 I was only 10 minutes away from my destination, so I started looking at other parts of my car to capture a photo of ice for this week’s CTE photo challenge on the letter I. When I finally arrived at work, I crawled into the back seat of the car, switched to my 50mm lens, played with the aperture, testing a few settings from f/1.8 to f/3.5. I was fairly pleased with the final outcome, but I really wanted that ice falcon from my windshield.